Strawberry ice sour straws – Large clouds with huge flavor on top of it! When you inhale Strawberry Sour Straws Ice vape, your tongue will cool down instantly thanks to strong menthol. Then, sweet strawberries will burst on the palate. As you exhale, surprising sour candy gives this vape juice flavor an extra layer of deeply refreshing intensity. 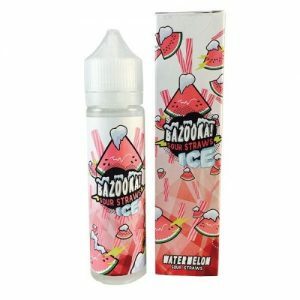 This e-liquid comes in a 60ml unicorn bottle and is available in three different nicotine strengths. Strawberry Sour Straws Ice has a 70 % VG and 30% PG base. This allows for those massive and fluffy vape cloud and a nice smooth flavor.